BUY BOYS SUITS FROM THE IMPORTER; ITALIAN SUITS, OVERNIGHT DELIVERY AND NEAR WHOLESALE SALE PRICES! 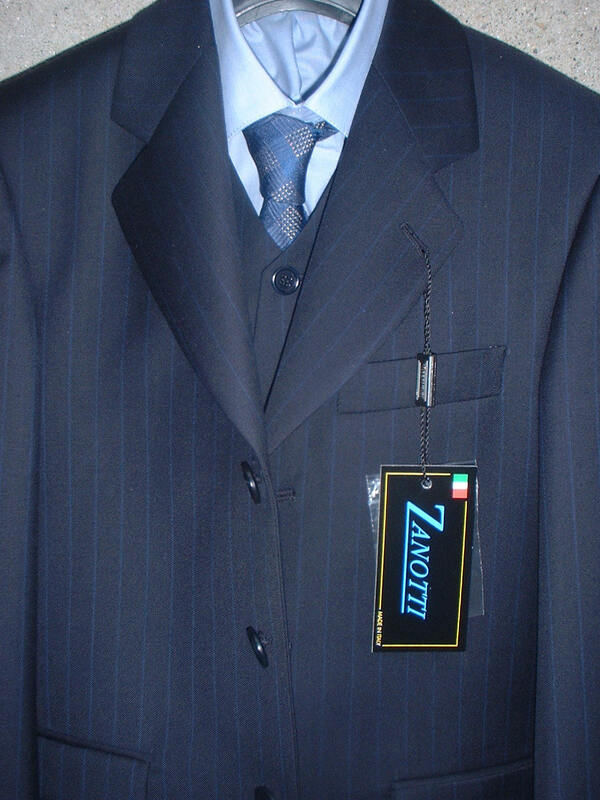 BOYSITALIANSUITS.COM is the internet's premier wholesaler and retailer of Wool Boys suits and coats made in Italy, offering individual service, wholesale prices and true Italian quality. 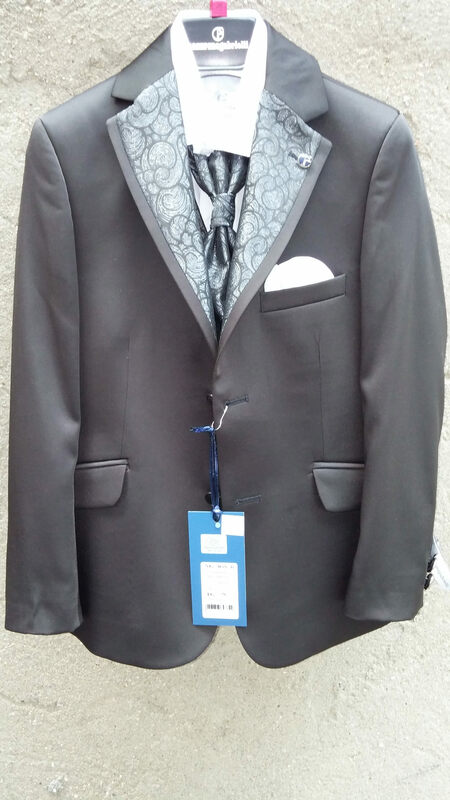 Our suit selection is primarily made up of Made in Italy boy's 100% fine super 120 Italian wool suits as well as white silk blend suits fo First Communion, custom made in Italy for our customers. As one of America's largest importers of Italian children's clothing and as a division of one of New York's largest children's clothing stores, established 1951 and proudly ZAGAT shopping guide listed, we always offer you a pleasant way to shop for dress clothing, Bar Mitzvah, First Communion suits or Prom suits with knowledgeable advice and knowledgeable phone help a call away. Questions? Simply phone us toll-free at 866-782-0108 or visit us. Huge selection of Boys Suits! Our New York area warehouse always stocks over 1600 quality Italian dress boys suits and Italian boy's wool coats, including even and odd sizes up to 24, stout and husky size suits. Our experience and connections in Italy and our large inventory in the U.S. allow you to select your favorite and not compromise. 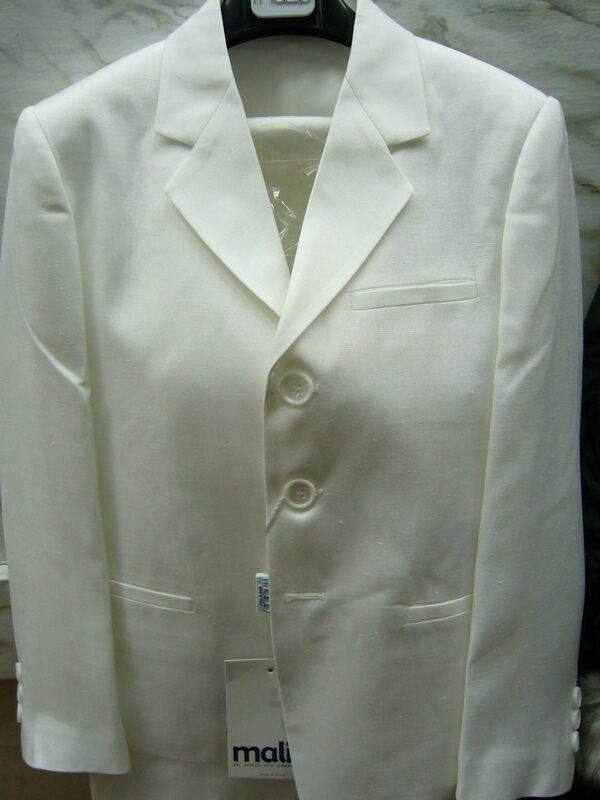 We also offer a selection of fine white silk suits often used for First Communion. Our selection is supplemented by our Italian Custom Made Boy's Suit selection, where we routinely custom make one or multiple suits for a family wedding or special occasion. Great prices! As the importer and wholesaler we can do better and we always do. Compare our $179-$289 (or $385 for silk blend suits) to others charging $335-$550 for the same high quality Made in Italy boys' wool suits if you can even find Italian suits elsewhere. Remember; we discount most of the famous brands that we offer! As others quietly switch to lower quality products we proudly took delivery of our latest Italian production of Italian boy's suits and wool topcoats. These suits continue our practice of making these suits in Italy of fine Italian wool from Italy's finest mills. Up to Date selection! As others quietly switch to lower quality products we proudly continue to take delivery of our custom produced production of Italian boy's suits every month. These suits continue our practice of making these suits in Italy of fine Italian wool from Italy's finest mills. AMEX, MC, VISA, DISCOVER, SSL_Security, chip transactions, same day shipping at low cost (starting at $6, overnight available at higher cost) and an easy refund policy on internet sales! Superb quality! We can truly state that our silk blend or super 100, 110 and super 120 wool suits and coats for boys equal or exceed the quality of any selection you might find in stores or online. Most of our suits for boys are made of wool from the prestigious VBC Vitale Barberis Canonico mill in Biella, Italy. Unlike other websites or stores, we have not abandoned Italy. Some competitors will politely steer you to new boys suit labels that are made in China, often claiming that there are no more Italian Suits while charging you more for the unique experience of Italian fashion made in China. Visit our stores, recently listed as Best of New York for Dress Clothing by NEW YORK MAGAZINE, ZAGAT Shopping Guide recommended and as seen on network television. BoysItalianSuits.com fully supports the ConsumerWebWatch guidelines to promote credible information practices on the Web. For more information click here. Our name and address and telephone numbers are at the bottom of every page, or visit our about us page. The challenges of the crazy world economy will serve our customers well. We have just returned from a buying trip to Italy, it went very, very well, new production has shipped during January 2019. 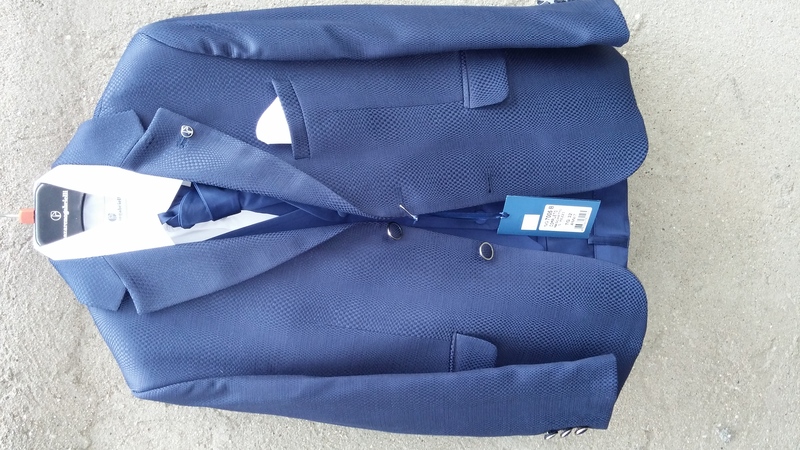 As others have abandoned Italy as a source for boys suits our suppliers were very glad to meet us and we wrapped up good deals on wool boys suits and boys coats, deals that will astound all those familiar with Italian suit production. The world economic situation has even affected the business outlook in Brooklyn, NY, we courteously welcome new clients that have been searching for white Communion suits as featured by for Festival of Brooklyn. Remember, when a competitor says that suits or clothing are not made in Italy any longer he is really saying" I am being dishonest to save my business". We are also gratified by the response to our Boy's suits by Appaman well as the coats and jackets for boys and Girls, all again by Appaman. We have been very inspired by interest in the Appaman and Piniero selections as well as others. If Italian boys dress clothing, formal wear and wool coats (as well as blazers, wool girls or boys coats, shirts, and ties), boys formal wear and anything pertaining to dress clothing all sound too good to be true, please browse our site, or just phone us at 866-782-0108 or CONTACT US. We are also available, experienced and ready to assist those seeking clothing for commercial photo or motion picture industry (movie) clothing needs, we are familiar with budget, time and various shipping requirements and will work with you. Please note; while we do carry some Perry Ellis products including some Perry Ellis suits and Brioso shirts there are some items we do not carry, these include boys suits by Joseph Aboud (the raincoats are in stock), Hickey Freeman, Mezzanotte and Princeton. We now sell fine Italian white First Communion suits, we have now found an Italian source for high quality white suits.